There are certain herbs that have resulted successful in controlling blood sugar levels since the ancient times. In our days, more and more attention is paid to the benefits of the natural herbs for diabetics in lowering blood sugar. Many studies have supported the use of certain herbs as an alternative treatment for diabetics (especially for those with type 2). However, there is still paucity of data on human clinical trials to support their benefits although many good results obtained from experimental studies on rats. 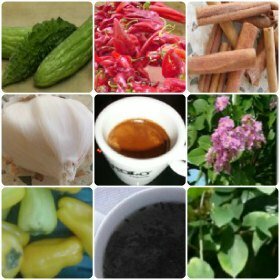 Below, I will give the list of these natural herbs, and the related research (in humans or animals) for each of their benefits in diabetes. A randomized, controlled trial was carried out in 109 type 2 diabetics from Dr. Crawford, Mike O'Callaghan Federal Hospital, Las Vegas. They were omitted to take one capsule (1 g) of cinnamon per day, for 90 days (1). It resulted that cinnamon lowered HbA1C by 0.83% compared with usual care alone lowering HbA1C by 0.37%. As a conclusion, taking cinnamon is very useful to lower HbA1C in type 2 diabetics with HbA1C >7.0 in addition to usual care. Thus, cinnamon has the rights to be listed among the herbs. The intake of 50 to 60 ml of bitter melon juice has resulted to reduce blood sugar levels and good control of diabetes in some clinical trials (2). Meanwhile, Professor David James, Director of the Diabetes and Obesity Program at Garvan, states : "We can now understand at a molecular level why bitter melon works as a treatment for diabetes. By isolating the compounds we believe to be therapeutic, we can investigate how they work together in our cells." As you may probably understand, the molecular aspect of hypoglycemic action of bitter gourd is now revealed and benefits are real to list it in herbal treatment for diabetes. Since 1990, studies carried out to show the effects of gymnema sylvestre in lowering blood sugar, have concluded that people with type 1 and 2 diabetes can take advantage of this action (3). Further studies have elucidated the components inside gymnema sylvestra, which are responsible for its hypoglycemic action (4). In vitro and in vivo clinical studies has discovered the hypoglycemic action of fenugreek among the herbs for diabetes, and the components responsible for this action (5). Studies have revealed that fenugreek may reduce blood sugar by inhibiting carbs digestion and absorption and enhancing peripherial insulin action (6). In experimental studies, it has been shown that fenugreek leaf powder may also reduce antioxiddattive stress (7). What is more, studies in rats has shown that fenugreek not only may lower blood glucose levels but also may reduce serum lipids (8). 2. Garvan Institute of Medical Research (2008, March 27). A Ton Of Bitter Melon Produces Sweet Results For Diabetes. ScienceDaily. 3. Liu HM, et al. Isolation and structure elucidation of gymnemic acids, antisweet principles of Gymnema sylvestre. Chem Pharm Bull (Tokyo). 1992 Jun;40(6):1366-75. 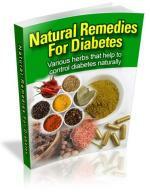 Click here for more scientific data on herbs for diabetes. 4. Kanetkar P, et al. Gymnema sylvestre: A Memoir. J Clin Biochem Nutr. 2007 September; 41(2): 77-81. 5. Vijayakumar, et al. The hypoglycemic activity of fenugreek seed extract is mediated through the stimulation of an insulin signalling pathway. Br J Pharmacol. 2005 September; 146(1):41-48. 6. Soluble dietary fibre fraction of Trigonella foenum-graecum (fenugreek) seed improves glucose homeostasis in animal models of type 1 and type 2 diabetes by delaying carbohydrate digestion and absorption, and enhancing insulin action. Br J Nutr. 2007 Mar; 97(3):514-21. 7. Supplementation of fenugreek leaves reduces oxidative stress in streptozotocin-induced diabetic rats. J Med Food. 2005 Fall;8(3):382-5. 8. Supplementation of fenugreek leaves lower lipid profile in streptozotocin-induced diabetic rats. J Med Food. 2004 Summer; 7(2):153-6. Herbs for Diabetes Questions Problems ? Get Help Here. This is the place where you can ask a question about any aspect of Herbs for Diabetes.